Green Chile Corn Chowder is a HIT! This is one of the best soups I've ever had from a supermarket. 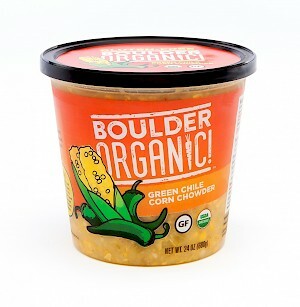 The green chile and corn flavors come through loud and clear, the mouth-feel of the soup is perfect, as is the aroma. There is no cream in this chowder and 8 ounces is just 130 calories, 4 1/2 grams of fat, 7 grams of sugars and 4 grams of protein. The whole kernels of the sweet corn are delicious. My only complaint is I wish they had put better cooking instructions rather than just saying 'warm to desired temperature'.